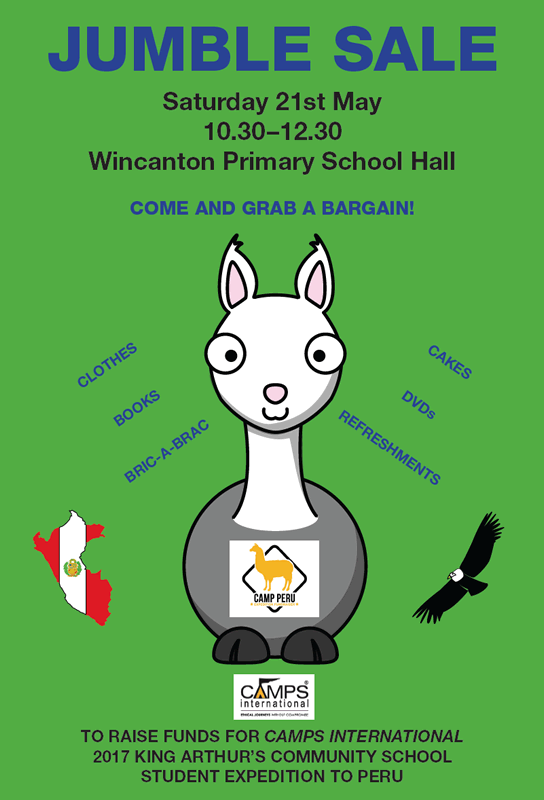 King Arthur’s students invite you to grab a bargain at a Jumble Sale on Saturday 21st May at Wincanton Primary School from 10.30am to 12.30pm. 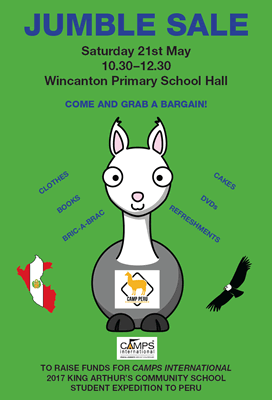 The sale, which will include cakes and refreshments as well as all the usual jumble bargains, is raising funds for a group of students who are undertaking an extraordinary, month-long expedition to Peru in 2017. The trip will see the students taking part in various project-based conservation efforts to help local Peruvian communities, with a four-day trek to Macchu Picchu towards the end of the expedition which will test their endurance. A portion of each student’s cost for the trip goes directly to the Peruvian communities where they’ll be living and working. If you’re having a clear out and would like to donate any jumble for this event, please contact me on 01963 824822 or email and I’ll arrange collection.